Unable to attract passing ships, he caught fish in the mornings and read his Bible in the afternoons. Aldi Novel Adilang recounted being circled by a shark at one point during his 1,600-mile journey from Indonesia. He was rescued earlier this month near the U.S. island territory of Guam, officials said. He ate fish and read his Bible daily during the ordeal. Adilang was later reunited with his family at their remote coastal village after being brought to Japan, where he recuperated with the help of consular officials. “Aldi said he had been scared and often cried while adrift," Fajar Firdaus, a diplomat at the Indonesian consulate in Osaka, told the Jakarta Post on Sunday. Even before his odyssey began, the 19-year-old already had a lonely job as the solitary worker on a rompong — a floating fish trap with a tiny wooden hut equipped with a gas stove, cooking utensils and a generator. Aldi was contracted by the rompong's owner to light lamps around it nightly for six months in order to attract fish. Each week, the owner would send someone to collect the fish and replenish supplies of food, fuel and drinking water. On July 14, a storm snapped the rope that anchored the rompong to the sea floor off the coast of Manado, in far northeast Indonesia — some 1,300 miles from the capital, Jakarta. He wasn’t found until Aug. 31 when he was spotted in waters off Guam by a Panama-registered bulk freighter, MV Arpeggio, which was heading for Japan, the consulate said in a Facebook post. 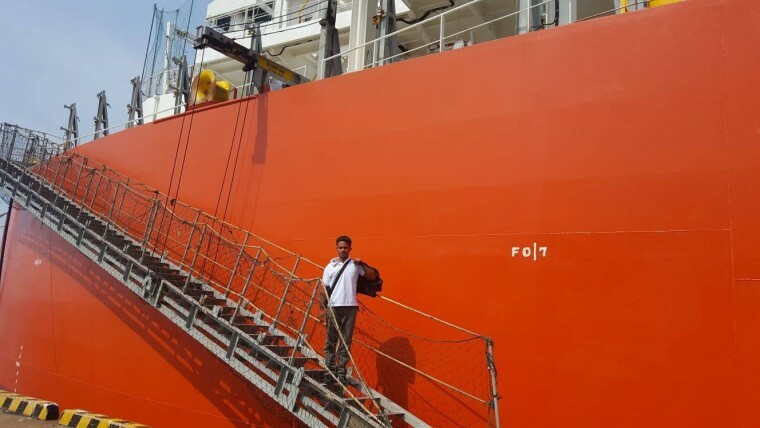 "Every time he saw a large ship, he said he was hopeful, but more than 10 ships had sailed past him, none of them stopped or saw Aldi," Fajar told the Jakarta Post. The freighter’s crew gave Aldi a towel and a snack then fresh clothes and food. The ship's cook even cut his hair. Aldi arrived in Japan on Sept. 6 from where he was flown from back to Indonesia after consular officials verified his identity. He eventually returned to his home on Sept. 9 and is in good health, the consulate said. The teenager recounted that, with only a week’s worth of supplies on board, he had to improvise in order to survive. “After he ran out of the cooking gas, he burned the rompong’s wooden fences to make a fire for cooking,” Mirza Nurhidayat, another consular official, told the Jakarta Post. “He drank by sipping water from his clothes" that were damp from the sea. Aldi told local media he developed a routine of catching fish in the mornings and reading his Bible in the afternoons, and made a makeshift shower using sticks of bamboo. He said he cried while thinking about his family because he thought he would never see them again. One day his rompong was circled by a shark. "I could only pray that the shark went away,” Aldi was quoted as saying by the TribunManado news site.